Robert "FunGuyInspections" Rocks ! Funguy made my mold problem very easy to deal with ! very fast and cost efficient! Highly recommend! We look forward to hearing from you. Our expert Mold Consultants are standing by, Schedule Now! Please Select One ----> I would like to schedule a mold inspection. I have had recent water intrusion. Question about our sevices? Company: How did you find our website? Robert from Fun Guy is your secret weapon when you are questioning if your building maybe sick from water damage, mold, lead, asbestos or other environmental factors. We inspect apartments, condos, million dollar homes, commercial and hospital facilities in Los Angeles, San Diego and Ventura Counties. Can Black Mold can appear in any home? Most molds that appear black may indeed be a combination of Stachybotrys, Ulocladium or Chaetomium. In order to tell what type of black mold may be growing inside your home a laboratory sample is needed. BLACK MOLD, WHAT OTHER MOLDS Are BLACK? Black Mold Can be Many Different Types of Mold, Common Types of Black Mold can be Penicillium, Cladosporium, Stachybotrys and a Few Others. The Color of Mold Growth will Usually Depend on the Substrate (Materials it Grows On) and may be several different color. When Extensive mold Growth Happens for a Period of Time, the Remaining Blend of Color May Appear to be Black. BLACK MOLD - FUNGI GROW and FEED On. . .
Fungi feed on paper and wood consisting primarily of cellulose, ligin and hemicellulose. 3 Polymers that combine to create the mass and integrity of this structural material. Wood will also contain a number of different proteins, sugars and starches. These available materials are an initial food source for the fungi to feed. Fungi grow under the proper conditions, wood may be colonized by a variety of fungi (Davidson, 1935; Dowding, 1970; Kaarik, 1980). A recent study at Oregon State University revealed that Douglas fir sapwood was colonized by over 45 species of fungi within six weeks after sawing (Kang, 2000). It really depends on who you ask. The best thing to do is to sample as soon as possible and learn more information about your environmental conditions. Elevated level of mold spores can indicated an unhealthy environment to some individuals. Have you Found that a Musty Smell or Odor Persists in One or More Areas of Your Home? Do You Think That Mold Growth May Cause Allergies or Illnesses? Fun Guy Inspection & Consulting LLC is a Premier Water Damage and Mold Inspection Company that Specializes in Locating Areas of Black Mold Growth Conditions within Your Home or Office. Above Photo: visible mold growth was observed on the interior of a wall cavity. 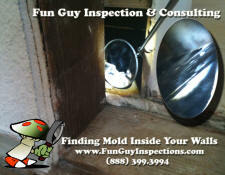 Fun Guy Inspections creates Mold Inspection Reports with Mold Remediation Recommendations. A newly published guideline from ASHRAE gives facility managers and building operating staff a strong foundation on which to improve performance of all buildings. “Modern air conditioning systems protect the health, comfort and productivity of building occupants,” ASHRAE Presidential Member Bill Harrison Attention all Facility Managers and Building Operators, Updated 04-09-2012. Phoenix, August 14:TBA. November 13:TBA. Contact Derrick Denis at derrickdenis@csceng.com or call Stephanie at 480-460-8334. Los Angeles, July 19: Case Studies of Identifying Unknown Materials. Commercial and Residential Odor Investigations. October 25: TBA.Contact Stephen Roquemore at Steve@affordableinspections.biz. Pensacola, July 12: Sampling Methodology. Respiratory Protection Program Requirements. Contact Melissa Helmick at mhelmick@emsl.com or call 850-207-5980. Atlanta, August 3: TBA. November 2: TBA. Contact Wendy Miller at wendy@healthyairquality.com or 706-278-3202. Seattle, September 13: TBA. Contact Mike Smith at mike.s.smith@amec.com or 425-368-0969. Milwaukee, November 1: TBA. Contact Wane Baker at wab@michaelsengineering.com or 608-785-1900.